It was my birthday yesterday! And it was amazing! I woke up laughing because I had a dream. It was a dream of the Yoga Mafia. My entire Kundalini Yoga class was inside a room being held hostage. There was a man there who worked with the Yoga Mafia, with an Italian accent (when I try to do it I sound Mexican). His name is Groupie. I convinced Groupie to call his boss, but the boss didn’t answer. “It’s too late. You’re going to die.” In his Italian-Mexican accent said Groupie. “But we can leave a message!” said I! “Oh yeah, the frequency can be recorded.” Said Groupie. I convinced Groupie to call his boss back and let me leave a message. When I was done leaving my message Groupie deleted the message. “You have to find the rhythm between the rhythm.” said Groupie. “What?” I rolled my eyes, and tried recording a message several more times with Groupie deleting them all. Joy suddenly stood up, “I’ve got this guys!” She attempted a recording that was also deleted. Then I woke up to get reading for Aquarian Sadhana. I was laughing, telling everyone that the Yoga Mafia was coming for us. We made our sleepy way to Karma Teachers and began our sadhana. During our chant of devotion, the twenty-two minutes of Wahee Guru, we all saw three brilliant white-blue flashes of light occur in different spot of the studio, just like someone was taking picture even though no one was. Even though some may argue, I believe it was the angels coming to say hi. 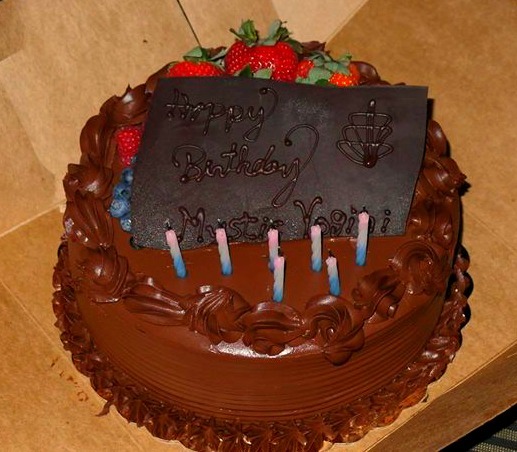 My friends and yoga buddies surprised me with a vegan chocolate cake from Whole Foods that was amazing! We all enjoyed our cake at 6:30 AM before heading home to nap. Being a yogini you get to eat cake at some interesting times! It was a wonderful surprise! They even put Mystic Yogini on the chocolate cake, which I would’ve never expected! After cake, we departed for our respective naps. During my nap I had an other yoga dream. This time though I was shopping for white yoga clothes at a thrift store that was just filled with them! P.S. If anyone wants to write a Yoga Mafia Comic Book I totally love it, and would love to be a part of it!